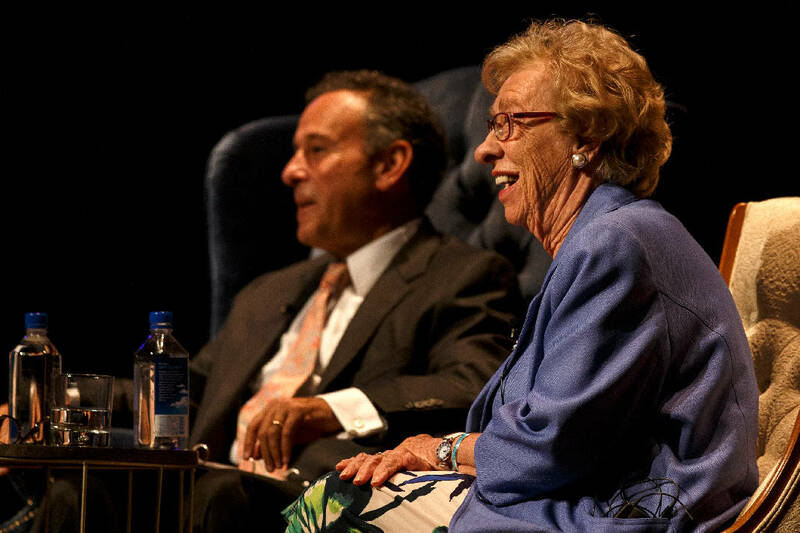 Holocaust survivor Eva Schloss, right, smiles on stage during the Voices from Auschwitz program at Soldiers & Sailors Memorial Auditorium on Sunday, Oct. 14, 2018 in Chattanooga, Tenn.
One of the last living Nazi death camp survivors warned of the dangers of intolerance toward refugees while sharing her life story in Chattanooga Sunday. "You know, nowadays, millions and millions of people, of refugees, there is discrimination against them," Holocaust survivor Eva Schloss said. "People try to make a new life in a safer country, and again people close their doors to these people. It's our fault we are closing our doors." The talk was quickly steered back to Schloss's life story, but the Auschwitz survivor later urged listeners to show compassion toward everyone. Schloss has traveled the world, speaking about those dangers and sharing her experiences. She believes the fear people have of others from different cultures explains pain all over the world, and she is urging everyone to be better. Schloss spoke inside Memorial Auditorium at the "Voices From Auschwitz" event Sunday evening in front of 2,000 guests. It was the biggest crowd she's ever spoken to, she said. The 89-year-old London resident survived the infamous death camp with her mother, Fritzi, after the Nazis abandoned the camp as Russian liberators descended late during World War II. They deemed the two women too sick to walk on the pending death march that would ultimately kill her father. Her widowed mother would later marry the widowed father of Schloss's childhood friend Anne Frank. As Frank's writings gained worldwide popularity, Schloss grappled internally. She was devastated by what she had witnessed and wondered if the world was ready to hear the Holocaust's more extreme stories. She had slipped into depression and had a deep hatred for the Nazis and their sympathizers. However, she eventually found happiness in her own family and through the marriage of her mother to Otto Frank. She began to show compassion, forgiving the Germans — but still not the Nazis, she said — and shared her stories. She has written three books, the first of which was titled "Eva's Story." Schloss sat in a beige chair, across from moderators Julie Edwards, of WRCB-TV Channel 3, and Erlanger Vice President of Public Relations and Marketing Jed Mescon. The blue blazer she wore over her colorful dress covered the faded black numbers tattooed on her left arm. The idea for Schloss's visit came from Chattanooga Rabbi Shaul Perlstein, who saw her speak at an event in Knoxville. Organizers were told it would take years to book the Holocaust survivor, but they discovered she was longtime friends with Erlanger CEO Kevin Spiegel and his wife, Judy. "Her message is absolutely important for people in Chattanooga and everywhere to hear," Judy Spiegel said. "It's a story we should never forget. Holocaust survivors are aging, and we won't be able to hear their stories in the very near future." During the speech, the crowd sat quietly as Schloss told stories about her childhood and life as a Nazi prisoner. She recounted heart-touching memories about life in hiding and her family. She spoken highly of her talented older brother, Heinz. The boy was unable to play his piano while the family was in hiding, so he learned seven languages and taught himself to paint by the age of 16. She detailed a fond memory the two shared. While hiding, Schloss wanted to see the new movie, "Snow White." They both knew that wouldn't be possible, so Heinz covered the windows with cardboard and painted the characters for his sister to enjoy at night. It was one of her final memories with her brother. He was later killed by Nazis seven days before U.S. troops liberated his camp. Schloss will speak again in Memorial Auditorium on Tuesday to 4,000 schoolchildren before traveling to Memphis.